This salad is packed with familiar treasures of the sea, including Norwegian smoked salmon, silver bait and sakura ebi, and garnished with a dizzying array of herbs and vegetables, aromatic spices, nuts, and crunchy salmon skin. All that's left to do is to dress it all in an interesting mix of spring onion-infused olive oil and wild honey yuzu. Available from January 15 to February 19. True to its name, this option is packed with lavish ingredients such as Alaskan crab meat, black truffle, and caviar, set atop a mountain of crunchy noodles and surrounded with strips of cucumber, leek, carrot, radish, red cabbage, rosella fruit, and pomelo pulp. There's even a vegetarian option made with fruits and vegetables, and a velvety spring onion sauce—a signature of Cherry Garden. Because there are always ways to make the prosperity salad healthier, the culinary team at Hu Ting takes it up a notch by mixing smoked salmon with organic seasonal greens, finely cut and topped with a specially imported crystal ice plant for a crunchy finish. House-made plum sauce tie the dish together with its unique, fragrance and taste. Available from January 21 to February 19. This is a classic “east meets west” ensemble one would expect from a restaurant famous for both its French and Chinese kitchens. Pickled chayote, cornichon, and kohlrabi are laid out on a large plate alongside shredded celeriac, finger lime caviar, and cured trout fillet. Give these a good drizzle of its housemade black garlic dressing before tossing the ingredients as high as possible. Available for dine-in (as part of the restaurant's reunion menu) or takeaway, from January 21 to February 22. Count on executive chef Nicky Ng to put his own spin on this popular Chinese New year salad. His version of the salmon yu sheng comprises the usual stack of julienned legumes, carrots, radish, and red cabbage. The surprise is the dressing, which is an interesting concoction of citron tea jam, housemade bean sauce and corn oil for a flavourful and zingy finish. Suffice it to say, it goes extremely well with the smoked fish slices. The name is an apt description of this new lo hei alternative, where a mound of crispy fried vermicelli is decorated with gold leaves to represent mountains of gold. These are surrounded by a delicious mix of colourful vegetables, sesame seeds, and crispy youtiao, as well as fresh salmon or yellow tail, if that’s what you prefer. And that's not all; bak kwa is thrown into the mix in a nod to the Year of the Pig. Available from January 18 to February 19. 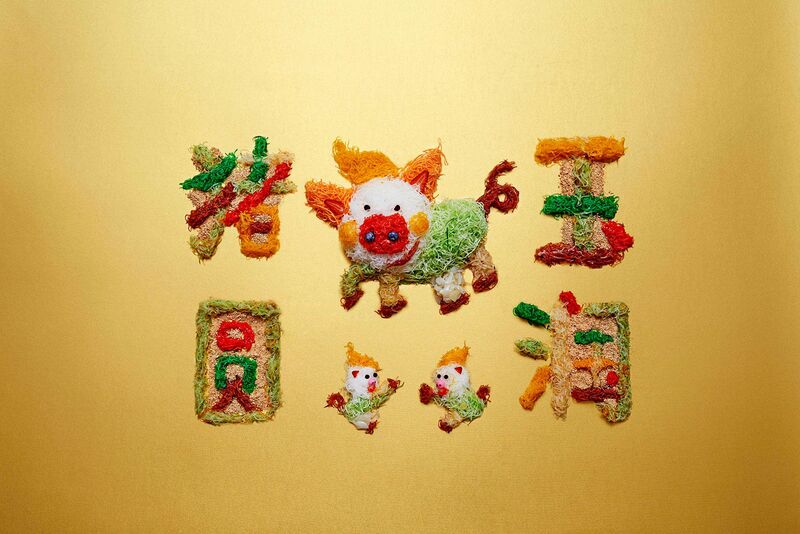 Not only does this lo hei win points for its artistic presentation, it’s extremely tasty too; one platter gives you a whopping 16 ingredients of shredded ginger, papaya, carrot, lemon leaf, among others, artfully laid out to resemble a cute pig. Fresh salmon slices liven up the fish, especially when it's drizzled with a tangy and fruity mix of plum sauce, plum paste, apple juice, peach paste and vinegar. How about an Italian-style yu sheng for a change? That's probably what head chef Felix Chong was thinking when he came up with this variation that sees plump tiger jade abalone, king salmon carpaccio and salmon roe mixed with carrots and green and white radish. More delicious twists are found in the addtion of pomelo, mango, orange, sake, yuzu and mangosteen, presented like caviar to brighten up the dish both visually and flavour-wise. This is served as part of the set menu, available from January 1 to February 5. Please call 6535 0724 or email enquiries@monti.sg for enquiries and reservations. It’s the Year of the Pig after all, so the chefs at Hotel Fort Canning jazzed up their prosperity salad with the prized prosciutto. Thin slivers of salty parma ham crown a fruity ensemble of julienned fresh rock melon, red dragon fruit, red apple, granny smith apple, green mango, green papaya, kiwi, and capsicums. Meanwhile, the base of the salad is your traditional shredded carrot, white radish, green radish, and red cabbage, and for added texture, crispy fish skin and lotus root chips. It’s finished with a piquant yuzu, plum and olive oil dressing. Available from January 17 to February 29. For orders and enquiries, please call 6559 6796 (11am to 7pm) or email thesalon@hfcsingapore.com.